As Homemakers back in the 50s and 60s my mom and aunties were very resourceful not wasting anything that can be reused as something else. The rice sack was one of those items. 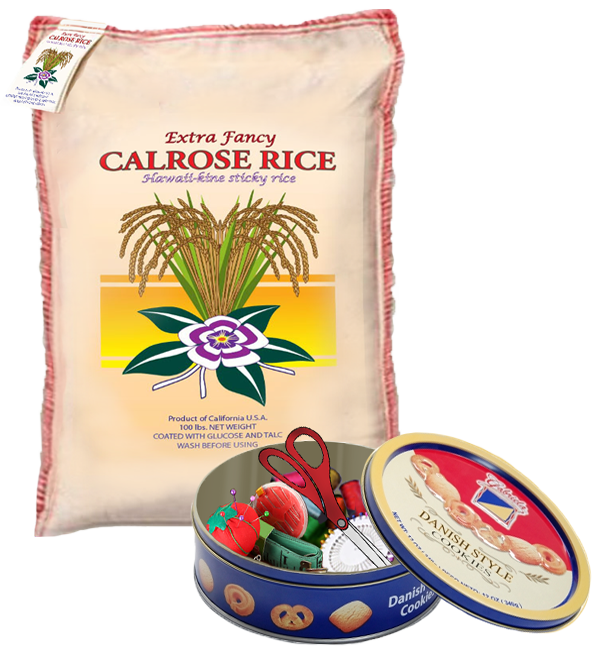 My parents only cooked Calrose rice it was the only rice they liked. I remember an uncle calling it the sticky rice and reminds him of back home in Hawaii. Sticky rice was preferred with the Japanese back in Hawaii to make Spam musubi, sushi rolls, and nigiri sushi. Sticky rice was easier to shape these foods. Sticky rice is also easier to pick up in clumps with chopsticks. My mom would cut the sack into squares or rectangles, overlap the edges and sew them together and make kitchen towels. Back then those rice sacks were made out of 100% cotton and after a few washings were pretty soft. When visiting Filipino friends and relatives I would see these towels hanging from the drawer cabinets in the kitchen. I wish I would've saved one of them, I would've framed it and hung it on the wall as a novelty item to remind me of our mother's resourcefullness. We always joke about Ilokanos being thrifty, I think the word for this is "Kareput" and it means being frugal and thrifty. I actually wish I would have been more like my parents when it came to being kareput. A valuable lesson I'm still trying to learn.